Building this house is a dream come true for us y'all! I've been posting lots of pics on Instagram but very few here. I thought I'd share a few collages of this process that started rolling last fall. Of course it all began with driving and wishing for the perfect lot. We wanted a little more space but within a neighborhood. We found that spot on a cul-de-sac next to the sweetest people. Back in January the lot was scraped and the forms were built. After lots of driving and trips to the brick and stone yard, we picked ours. 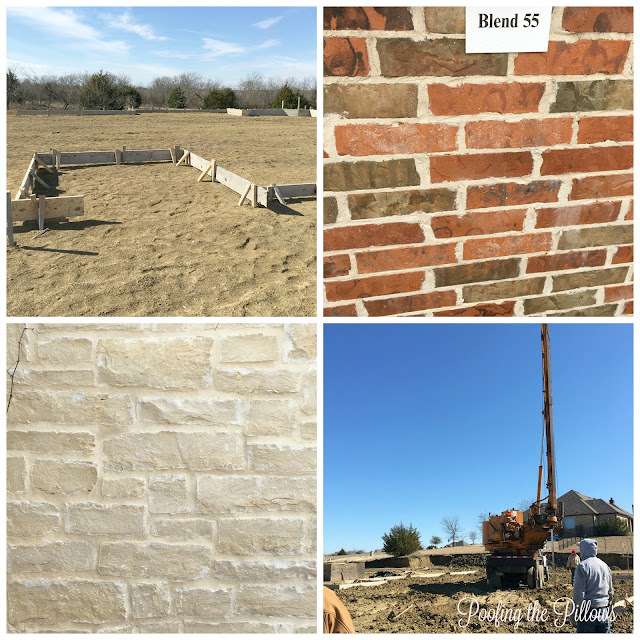 The brick is a mix of several colors and the stone is a soft cream with a little bit of gray mixed in. Then one afternoon we went over and these huge machines were injecting the ground to help make it more stable; with our Texas clay soil that is very necessary. Woops! One day we went over to discover that the master bath had been plumbed and framed for a different tub than the clawfoot I was planning on. Oh well...we rolled with that mistake and saved a bunch of money. The house was really beginning to take shape at the beginning of March. The third picture is the barrel ceiling in the kitchen. This might be my favorite part of the house. The fourth pic is the back of the house. We walk around every day and look at things from every angle. I'm sincerely so so glad to hear from you ! I wonder your gladness while you see this project of yours growing and becoming true, thank you for sharing your delight with us ! Wow thanks for sharing your project!!! I am in love with your new house... even before I see the inside all decorated. 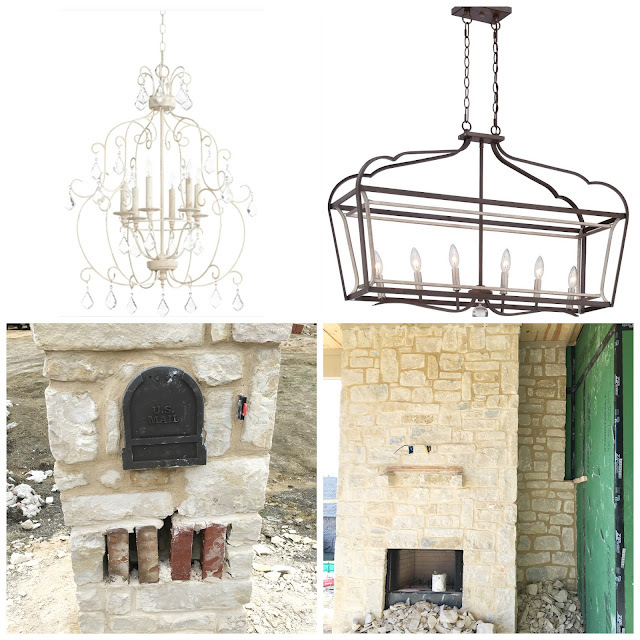 Your stone mailbox and fireplace are beautiful. You must be getting excited more and more each day as the move-in date gets closer. I'm so excited for y'all. 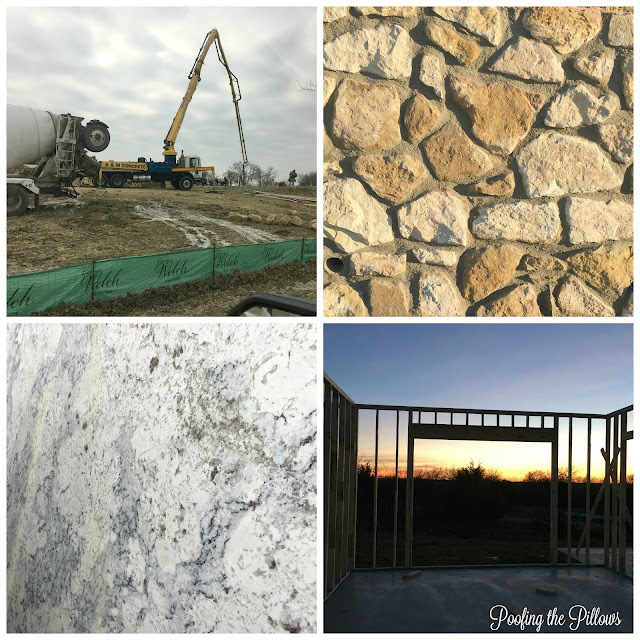 It's going to be a beautiful home! This is exciting! I can just imagine how you are feeling and pretty soon, you'll be moving in and making this new house your 'home sweet home'. What a wonderful view you'll have out of your kitchen window. Stacey, what fun to see the progress ! I know you are beyond excited. You're going to have a spectacular view from your kitchen! Isn't it wonderful to watch your dreams become reality? Can't wait to see more. Thank you for sharing. 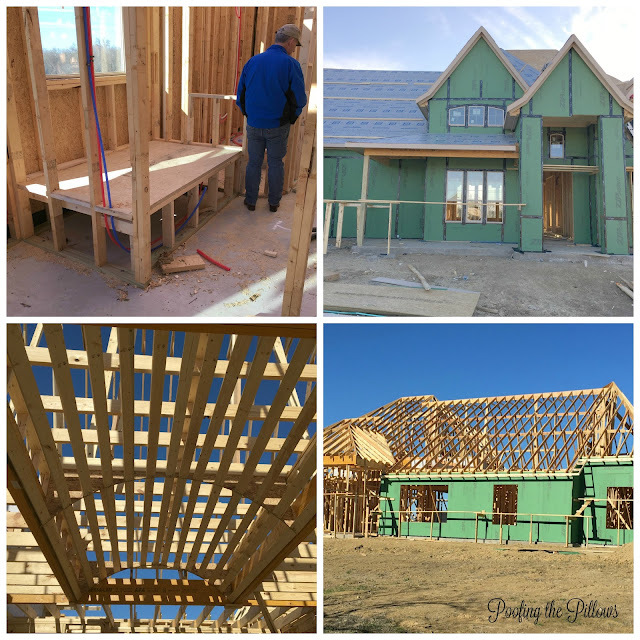 Stacey, love seeing the progress on your new home. I know you are anxious for it to be finished! This is so exciting! I love seeing your photos and all the progress!! Wow, Stacey! It's going to be beautiful. I'm so happy for you. June is just around the corner... I can't wait to see the finished house. Look how far along you are! I am envious. We originally thought we would be in our house in May, but now it looks more like July. You are not going to believe this! My kitchen granite is Dallas White as well! Oh Stacey, since I don't really get into Instagram, these just are the perfect antidote to my wondering how things were going with the house! I love the brick and stone you have chosen and your mail box is FOUR STAR! How lovely to have that view from the kitchen of a sunset when you will be tidying up after dinner! It looks as though it is going so well! Three cheers! I know you're super excited! I'm glad you showed it here because I don't do Instagram. I'm over the moon excited for you and I'm a few steps behind ya. We don't dig til June and move in November. I may need to pick your brain, lol. Cannot wait to see more! Stacey I couldn't be happier for you! I love the day to day progress, and I know you probably had a really hard time summarizing this post with just the few you selected. I know you have a zillion more, don't you? That barrel ceiling will be a showstopper, no doubt, but even grander will the sighting of the house with those sunsets from the kitchen! So exciting for you that move in day is so near! I would love to choose colors and brick but would find it nerve wracking. I just had to pick a new roof color and it was hard! I love all of your choices. What a unique mailbox. I'm a nut for sunsets and what a thrill to enjoy it from your kitchen each evening. Love all your choices. It will be beautiful. I love the mail box, but what's with the vertical brick in the bottom half? I'm not sure I can tell from the picture. And lucky you for getting such good neighbors. It's a blessing that doesn't happen to everyone. I'm happy to see so much progress, Stacey! Part frustration, part impatience to get into your new home! We've never had one built from the ground up but my sister did. She told me they had to pick out everything from the light fixtures to the doorbell! I know this is a lot of work and I admire you. Thanks for sharing your progress and some outdoor photos of your neighborhood. I can't believe how fast it's going up! So gorgeous! Your forever home is beautiful and the perfect spot for you and Paul. Welcome to our little spot of heaven in Texas. You are both precious folks. I am so excited for you and I know you are thrilled to be building this home! I love the fixtures and cannot wait to see how it all comes together! After all the issues we've had, I don't know if I could go through a building process like we originally planned. Maybe one day in the far, far future...LOL. Love and hugs!! I am so utterly happy for you, Stacey! How exciting to build a house from scratch and pick out every single detail to make it the most perfect home for you!!! Can't wait to see it completed, and follow along as you feather your nest! This really looks amazing. How fun. What fun and how beautiful! Many decisions to be made I am sure. Great to see your progress. Hey Stacey! Love the post and all the pics! We moved into our home on June 18; this year will be 25 years ago! Best of luck with all the remaining details and I can't wait to see what you continue to do with the place! I am enjoying watching your house build as we build our own too! We were hit by big rain delays with framing and roofing and stuff. I like seeing your picks because I am, well, frankly getting tired of picking out things! I'm so happy for you! It's all coming along so nicely! And how awesome that moving time is almost here. Can't wait to see the finished interior! I cannot wait to see what your new houselooks like. Building a home from the ground up is a tremendous task but so enjoyable too. I know this must be so exciting for you, and from what I can see so far it is going to beautiful! I had somehow missed this post! Goodness, that kitchen ceiling is amazing! I am so super excited for you guys! Such an exciting time! You have made some wonderful choices and its going to be a fantastic home!